Within the modelling activities of the three ICAMS departments, the department of Atomistic Modelling and Simulation works on the finest, most fundamental length scale of atomistic simulations. 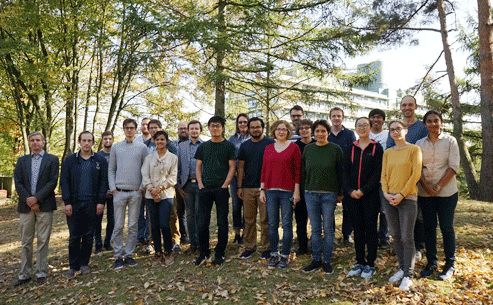 AMS group photo, October 2018. 3. to develop data-driven and high-throughput atomistic simulation methods for model validation and the discovery of novel materials. Interatomic potentials are obtained by systematically coarse graining density functional theory to effective models of the interatomic interaction. 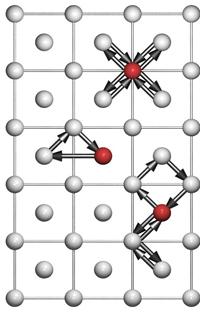 Potentials are employed in atomistic simulations for predicting structural stability and mechanical properties of materials and in rare event dynamics for modelling kinetics of phase transformations. In this way a coherent link from the electronic structure to the continuum description of materials on the meso- and macroscale is obtained. Within the framework of bond-order potentials the difference of the binding energy between atomic configurations is attributed to particular geometric features. Illustration of the atomic cluster expansion. Automated workflows together with high-throughput calculations are used to explore the chemical phase space of binary and ternary compounds, to validate trends in structural stability that are predicted by simplified models and for a systematic analysis of interatomic potentials. Density functional theory calculations and statistical machine learning are employed for computational materials design and assist and guide experimental research. High-throughput density functional calculations further help to improve and reparameterise thermodynamic databases. Three research groups represent the department‘s focus on establishing a coherent link from the electronic structure through atomistic simulations to meso- and macroscopical modelling hierarchies. A list of research projects currently offered in the department of Atomistic Modelling and Simulation (Prof. Drautz) can be found here. and 1.00 p.m. - 3.00 p.m.